In John Knox Street, a tablet marks the site of the house where the famous debate took place between John Knox and Quintin, Abbot of Crossraguel in 1562. The debate was on the doctrine of the Mass and lasted for three days, but was inconclusive as the people of Maybole tired of feeding the followers of the debaters who had flocked into the town to support their champions and brought the arguments to a sudden and definite end by burning all the papers on the proceedings on the Town Green. The Collegium at the foot of John Knox Street was an important ecclesiastical building and was last used for worship in 1563. 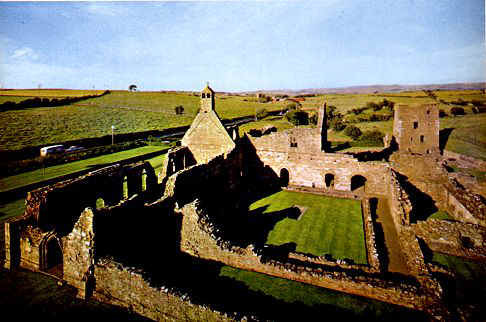 The ruins of the building, which was built in 1371, still stand and under the High Altar can be seen the graves of many of the Kings of Carrick, including David 1st Earl of Cassillis, who was slain at Flodden and whose body was brought home for burial in his own district. Although Maybole was a religious centre from early times, none of the present places of worship, by ecclesiastical standards are old. The oldest is the Parish Church in Cassillis Road, which is slightly over 100 years old and the other churches are the West Parish Church, Cargil-Kincraig Church, the Episcopalian, Roman Catholic and Baptist churches. Every church has both men and women's guilds while there is a strong Townswomens' Guild and newcomers and visitors to the town are always warmly welcomed to the various activities of these guilds. There are also Boy Scout troops, Girl Guides, Boy's Brigade, A.T.C., etc. and these organizations fully supply the needs of the younger generation. There are many other activities and Maybole is a very friendly and happy old country town, where one can find a quiet peace so rare in the busy world of today.